Courses meet once a week. 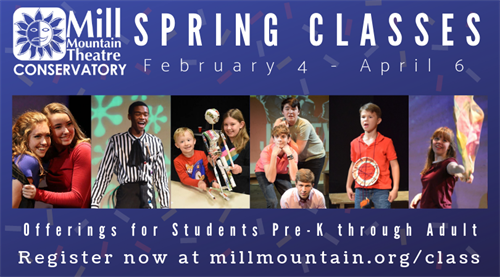 Spring Classes at Mill Mountain Theatre Conservatory have been announced, and we're so excited! Lots of fun new and exciting courses for students Pre-K through Adult. Music Theatre Song Study: Singing & Acting Solo Songs, Theatre Design: Puppetry and Performance, Teen & Adult Tap, "Seuss!" Preschool Music & Movement, "A Spoonful Of Sugar" K-2 & Elementary Music Theatre, Middle & High School Music Theatre, Music Theatre Conservatory, "In The Jungle!" K-2 Acting & Creative Movement, Stage & Special Effects Makeup, Acting Conservatory, "Incredible Heroes!" Elementary Acting, Playwriting, Middle & High School Acting & Improv, Foundations of Dance, and Theatre Dance (Drop-in Class). Be sure to see our full class listing on our website- millmountain.org/class.